Another waitress sees the message on the check, takes a picture of it and posts it to Reddit. Thus begins a social media firestorm leading to the firing of the waitress who posted the picture and making Applebees social media team pull all-nighters for several days. You can some of the Facebook blowback below. People lash out against Applebees on Facebook. The incident left almost every player involved looking bad, especially the Pastor and Applebees. 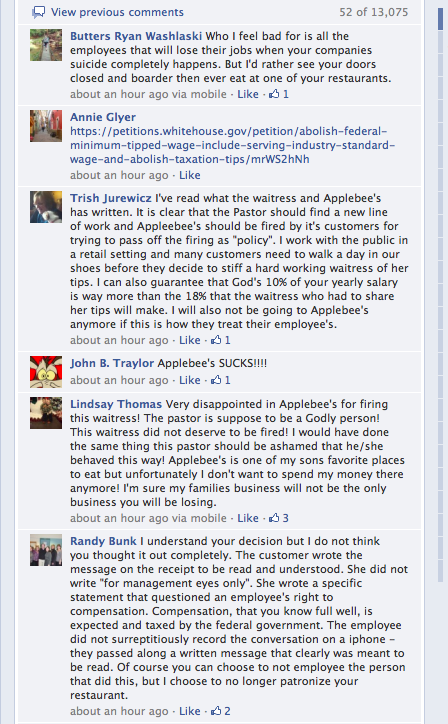 You can read an excellent recap of the Applebees social media meltdown here at R.L Stollar’s blog. This story made me think a lot about how companies should handle complaints in this new era of social media. The Applebee’s story should serve as a cautionary tale for many businesses. We might need to rethink the old adage “the customer is always right”. Because the “customer” isn’t just the one person sitting there in your restaurant complaining. The “customer” is the universe of people who will loudly voice their objections on social networks. What I find interesting about the Applebee’s story, is that restaurants should know better. When I was in college, I used to wait tables to make a little extra money. It wasn’t a fancy restaurant, but the manager was really focused on customer service. He would always say that a satisfied customer tells one person about his experience and a dissatisfied customer will tell 10 people. In today’s social media age, you can probably multiply that 10 by 1,000 if people take their issues to their Facebook, Twitter or just post a negative review on sites like Yelp or Kudzu. The result is that businesses can just get trashed online in a very public way. Do these review sites really matter? Well, I have heard business people say, “No one reads those reviews, it’s just a bunch of nuts with nothing better to do.” That could be very true. But, I’ll say this—you ignore customer reviews at your own peril. According to a study done by Google, 79% of shoppers read consumer reviews prior to purchase. So, like it or not, you have to actively monitor your online reputation and take any customer comments—even the crazy ones—very seriously. But what do you do about it? We’ll here’s my advice. And remember, it’s worth what I charge for it. First, do not ignore negative reviews. The reviews don’t just live on one site. They become part of your virtual permanent record. When a person uses a search engine to find your business, that review may show up in your company’s search results and you don’t want a bunch of 1-star ratings next to your company name on Google. Now, I think it’s just human nature to want to respond to what you perceive as an unfair comment. We’re wired to always try to get in the last word. But these online reputation battles don’t necessarily serve the business very well. In fact, this can actually do more harm than good, making both parties look silly and petty. The note came right from the CEO. This shows that the senior leadership of the company is concerned about these kinds of comments and wants to try to make them right. The CEO gave his number and email address for the person to contact. Again, that shows this company’s commitment to customer service. Even if the complainer doesn’t contact the CEO, people reading the review can see that this company is very responsive to customer issues. So, which business would you rather work with? The one that always has to be right and have the last word? Or the one that is concerned and wants to take action to resolve the issue? I think the answer is clear. Next time your business gets a negative review, take a deep breath and just remember that age-old saying, “The customer is always right,” whether they’re online or standing right in front of you. Very well said. I will go ahead and reblog this… this needs to be shared. Also, this brings to mind the question of organizations’ online reputation – or let’s call it what it is, their Glassdoor reputation. Managing glassdoor reputation, I reckon, is especially important too in this day and age… And spurious practices have started coming into play there as well. I hope you are keeping track of the social media mayhem with the Applebee’s check that was posted online. Read this post from the ‘Single Minded Proposition’ blog. This should tell you almost everything you need to know about it. How important keeping one’s reputation online has become! And most organizations (especially small-midsized Indian ones) haven’t quite figured out this monster yet. Will, dear readers, write a post soon on one of my favorite topics, a company’s Glassdoor.com page. I’m surprised the court of public opinion supports the Applebee’s ex employee. Something similar happened last year at a well known restaurant in Raleigh, Nc and I don’t remember any public outcry when the server was fired. Probably because the customer in that situation was being overly generous, vs the Applebee’s situation where the customer behaved inappropriately. I’m not a lawyer, but I assume jerks are entitled to the same privacy rights as everyone else. Imagine if u worked for a law firm or ad agency, and for one reason or another your client sends you an email stating they are not going to pay out the optional performance included in your contract. And you in turn post that email on the Internet for all to see. I’m pretty sure any professional services firm would terminate your employment if you shares your clients b2b emails with the world. I’m actually not at all surprised people are supporting the waitress. The customer behaved very badly in this case. Anyone who ever waited tables knows how it feels to get stiffed. The customer then rubbed salt in the wounds by writing her commentary about why she was justified in stiffing the waitress. This is just bad behavior. I’m glad the waitress called her out in a public way. I think there’s more to the story than we know. Ask yourself this question, How big could the “party” have been to have a $34.93 check? Did they come in for coffee and dessert, soft drinks perhaps? Then the waitress is upset because 8 or 10 people collectively have a 35 bill? So she puts the tip on the check? In all cases when a gratuity is added to my check the server loses money. It’s a gratuity for good service. 20% is standard, great or excellent service brings more. Put it on my bill as an expected amount, then that’s all you’ll receive and chances are the service was mediocre at best. Chris – I wish you were my customer back when I was waiting on tables. Unfortunately, 20% is not the norm for most people. I was usually lucky to get 15%. And I did get stiffed a lot. So, as a former waiter, I was definitely rooting for the waitress that posted the check online. I’m not saying it was the right thing to do or she shouldn’t have gotten fired. But, it’s good to see people’s bad behavior exposed. Hopefully other “tip-stiffers” will think twice before putting $0 tip on the check. Im sure they all had split checks chris! Doubt that is the total bill..normally large parties usually want separate checks. I wait tables so I know from experience. Ohh and for the server to lose money from you because they put the tip on the bill is just dumb. Alot of restaurants make it mandatory that you add it to large parties. Its a policy! Plus just remember the server has to tip out so the tip that you do leave them they don’t get the whole amount!